The International Baccalaureate provides an enriched curriculum that both covers and extends beyond regular Saskatchewan curricula in its depth and detail. It emphasizes the development of the necessary critical skills that university-bound students need to master: reflecting, inquiring, thinking, analyzing and evaluating. 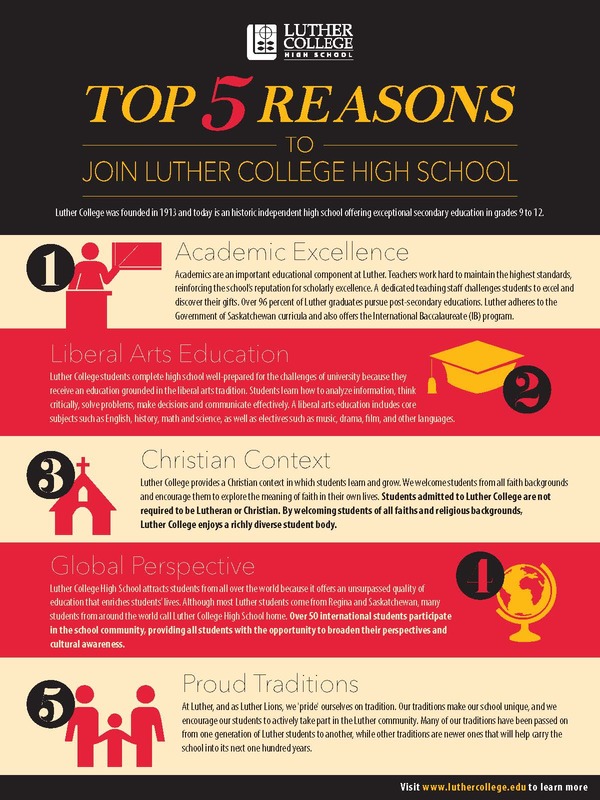 Luther College High School is a place where academic success is an achievement that students can be proud of. Luther College alumni receive international academic recognition. In 1983, in honour of his work in the study of mechanisms of electron transfer reactions in metal complexes, Dr. Henry Taube (HS'32, HSU'33) was awarded the Nobel Prize in Chemistry. Dr. Taube graduated from Luther College in 1933. Three Luther College High School graduates have been recipients of Rhodes Scholarships: Greg Brandt (HS’55), Robert Condon McKenzie (HS’66) and Jonathan Pedde (HS’10). High academic standards and a dedicated teaching staff challenge students to excel. Moreover, student successes are celebrated by teachers and peers alike. Luther College High School has dedicated itself to enriching the lives of students with a quality level of education that remains unsurpassed. Although most of Luther College HIgh School's students come from Regina and Saskatchewan, 12% come from countries outside of Canada. Luther College High School affirms the significance of respecting and embracing the cultures of other people. We believe that the cultural diversity in our international student body is a rich and vital experience for all our students. At Luther, students have opportunities to learn about and understand different cultures. Students are able to share ideas and experiences with people from a variety of backgrounds. These opportunities broaden students’ perception of the world, preparing them to take their place in the "global village" of tomorrow. Luther College provides a Christian context in which students learn and grow. We welcome students from all faith backgrounds and encourage students to explore the meaning of faith and commitment in their own lives. We believe that intellectual and spiritual growth should happen together. Daily chapel time fosters Luther's Christian community. The whole school gathers each morning to worship, laugh, listen, and learn together. Christian ethics classes are a place where students explore issues and questions involving religious faith, the existence of God, and religions of the world. Luther College is affiliated with the Evangelical Lutheran Church in Canada. Through the Lutheran Educational Conference in North America, Luther is one of several hundred Lutheran high schools, and seventy Lutheran post-secondary institutions, in the United States and Canada. Luther College student’s complete high school well-prepared for the challenges of university because they receive an education grounded in the liberal arts tradition. A liberal arts education provides students with a well-rounded, balanced foundation of knowledge and experience upon which to draw. It teaches students how to analyse information, think critically, solve problems, make decisions and communicate effectively. A liberal arts education includes core subjects such as English, history, math and science, as well as electives such as music, drama, film, other languages and physical education.